Turkish police and other officials enter Saudi Arabia’s consulate in Istanbul to search the premises in the investigation over missing Saudi journalist Jamal Khashoggi. TURKEY: Turkish Police on Monday searched the Saudi consulate in Istanbul for the first time since journalist Jamal Khashoggi went missing, as US President Donald Trump floated the idea that “rogue killers” could be to blame for his disappearance. Khashoggi, a Saudi national and US resident who became increasingly critical of powerful Crown Prince Mohammed bin Salman, has not been seen since he walked into the Istanbul consulate to sort out marriage paperwork on October 2. Turkish officials have said they believe he was killed -- a claim Saudi Arabia has denied -- with the controversy dealing a huge blow to the kingdom’s image and efforts by its youthful crown prince to showcase a reform drive. Trump despatched Secretary of State Mike Pompeo for what the State Department described as “face to face meetings with the Saudi leadership” to find out what happened. Until now, Riyadh has not allowed Turkish investigators to search the consulate -- officially Saudi territory -- with reports both sides were at odds over the conditions. But late Monday evening -- after Turkish authorities placed high iron barriers in front of the consulate -- a motorcade of six cars drew up and Turkish police and prosecutors entered the premises. Some police were in uniform while other officials were in suits carrying printers and files, an AFP correspondent said. 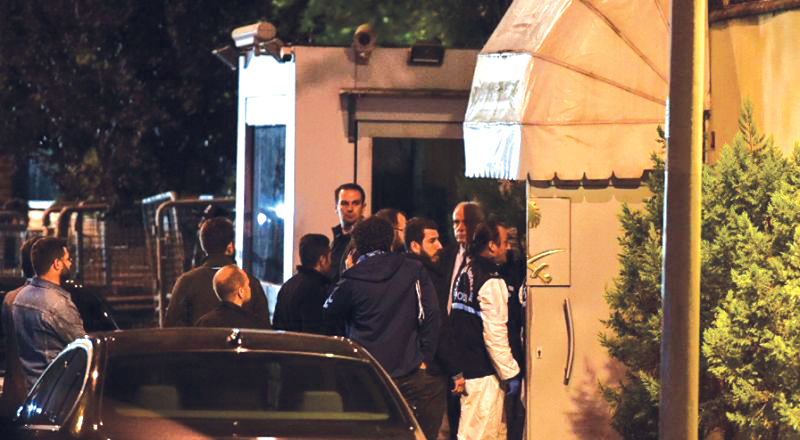 A Saudi delegation had entered the consulate one hour before the Turkish police arrived and appeared still to be inside as the search was conducted. A Turkish forensic expert was seen on the roof close to the consulate’s flag. After over three hours work, the teams were still inside the consulate. Riyadh’s most recent comments have focused on having no knowledge of any killing or denying any such order had been given.